OnePlus 3’s 16-step volume control has too coarse steps – 5 dB in the middle volume range. Maximum output level is -1.5 dBV (around 95 dB THD+N ratio), providing over 20 mW into a typical 32-ohm headphones – more than enough for any portable headphones. I’ve had my OnePlus 3 phone since last October. Generally I have been very happy with it, excellent value for money. I’ve had some battery drain issues, especially after upgrading to Android Nougat but it hasn’t been really an issue since factory reset – although battery life is still not the strongest point of this handset. Anyway, I can highly recommend the phone. However, one annoying feature is the way the volume control works. The steps are simply too large. I don’t listen to music horribly loud with headphones so with a sensitive pair of travel headphones, such as my AKG Y50, I find searching for the ideal level between two steps. At lower step the volume is too low, at next step it gets slightly too high. I am quite sure I was able to fine-adjust the volume by sliding the slider with my finger in my old Nexus 5 but in OnePlus 3 the level is forced into those pre-defined steps. 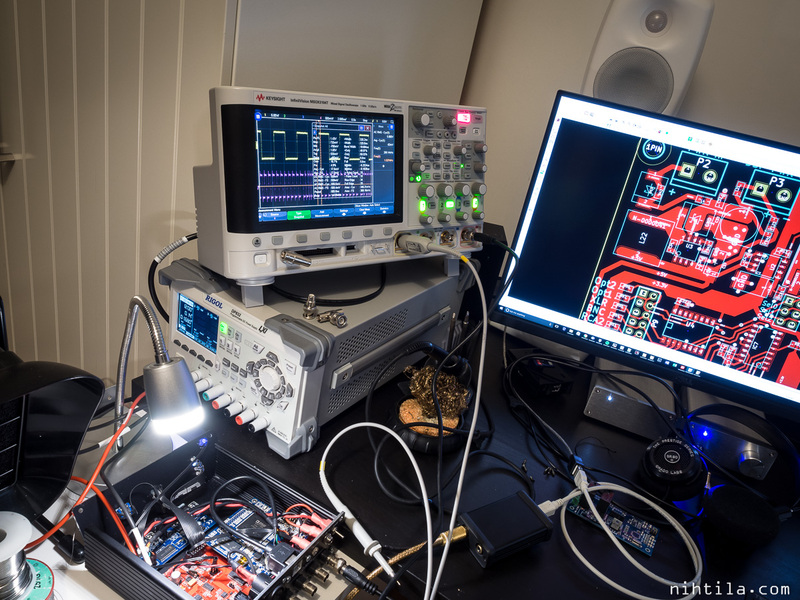 Win an oscilloscope in Keysight Scope Month – like I did last year! It is March again, meaning Keysight are having their Scope Month where they give away impressive number of free oscilloscopes. You still have plenty of time to win as they draw names every day in March to give away their new 1000-series entry level scopes. While the scopes are significantly cheaper models than last year, they give away a whopping five scopes each day in March. In addition, two 4000-series scopes are given away every week. I hear you say “I will never win anything”. Well, so did I – until they draw my name last year! I am now a proud owner of Keysight MSOX3104T oscilloscope. Not every maker has a 4-channel 1 GHz + 16 digital channel mixed signal touchscreen oscilloscope! If you do not enter you cannot win! You can enter once each day to maximise your chances. PS. I know, my fancy scope may not have the bench space it deserves but at least I have a fancy scope! This is my personal electronics website showcasing DIY projects, measurements, modifications, reviews, investigations, etc. Currently the focus is mainly on audio electronics. At least for now this is all just a hobby although I do have some spare components, PCBs, or unfinished or unnecessary projects to sell.